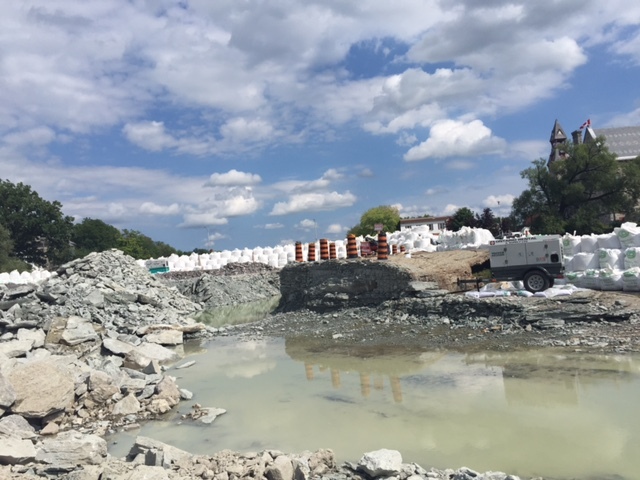 Blasting has been completed in the upstream section of the Enerdu Project. 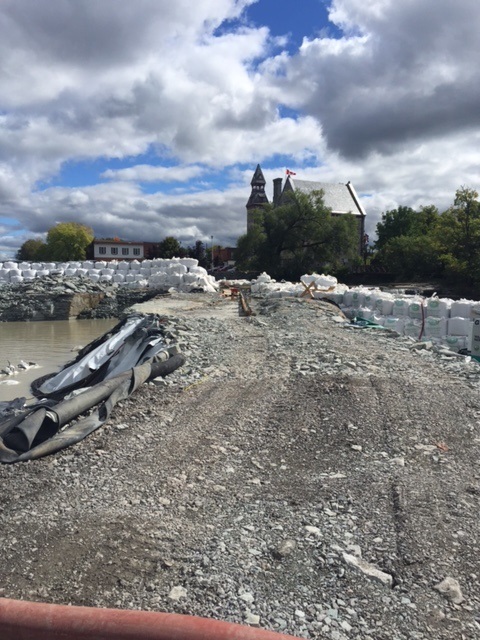 The area for the new weirs has been prepared and the footings will be poured shortly. All the materials for the new Obermeyer weir system have been ordered and materials for these are expected onsite early in October. Controlling water remains a challenge with many vertical and horizontal cracks in the bedrock that allows water into the site underneath the cofferdams and curtains. We remain vigilant in our efforts to ensure that turbidity levels are effectively managed. We remain in close touch with officials from the MNRF, MVCA, MOE, DFO and Environment Canada. Our biologist is onsite regularly to assist and provide advice. To address this water infiltration, the newly excavated area is being used as a settling pond along with portable weir style setting tanks. Water is being pumped into these areas, allowed to settle and then returned to the river. As we make progress on the work site, less and less water is penetrating, making control easier. We have also completed the dismantling of the existing powerhouse. 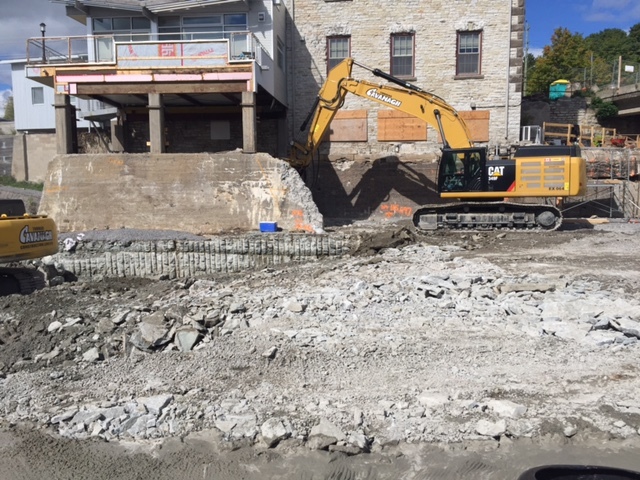 The old equipment and draft tubes have been removed and the area is being excavated so that a new pier can be created to support the existing Flour Mill building. This area will form the new bypass channel. A stoplog system will be installed at the upstream end and in the event of high water levels, these logs can be removed to assist in flood control. 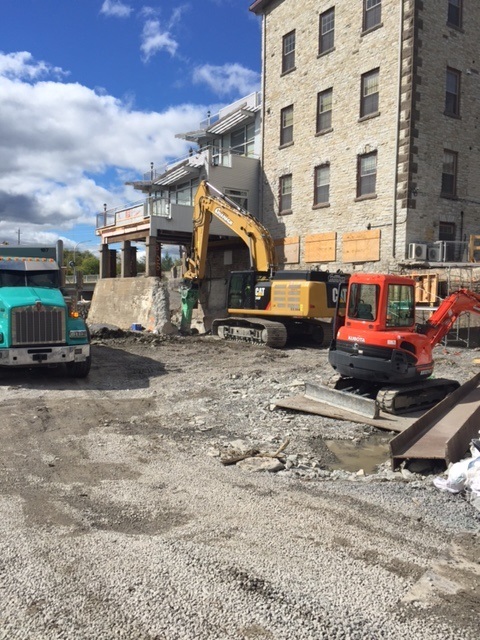 We have begun the excavation of the new powerhouse area. While blasting had been anticipated, to date we have only had to hoe ram. As we move more upstream, blasting may be required, but it will be kept as a last resort. Current plans see the beginning of concrete formwork to occur in early November. In summary the project remains on schedule. While there is a considerable work effort required to achieve the planned results before winter sets in, TCCL is committed to making it happen.